My laundry room renovation was a big success. It turned a truly awful space into a very functional and attractive space. 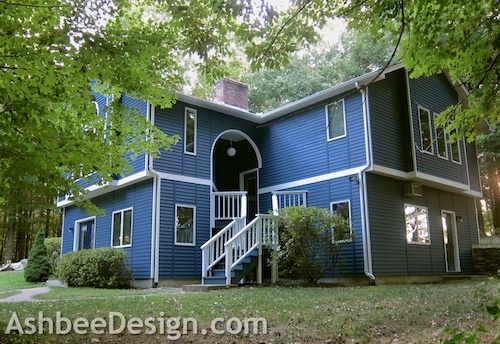 After it was completed my husband David asked if I would consider designing a similar upgrade to his studio/workshop. What? My husband asking me to help organize his space? I am sure there is many a blogger out there that dream of such an offer. While his space was in much better condition than my former laundry room (it did have sheetrock and a ceiling!) it had become over crowded and hard to work in. But first, a little more of an explanation because our set-up is definitely unique. David is a kinetic sculptor. 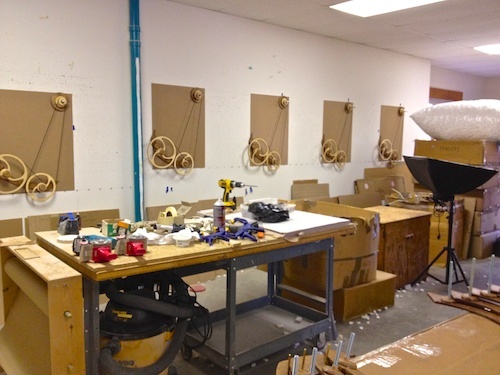 He has been designing and building kinetic sculptures full time since the mid 1970's. His first shop was in the space that is now our family room. Back in 1992 I told him we needed more space for the family and it was time for the shop to move out. We spent some time considering the options and decided that it made the most sense to build a structure on a separate building lot. It has the bones of a regular house but is used instead as a studio/gallery space. With this arrangement we can sell off the studio as a house at anytime we need to. It made more sense than to build a studio on our house site. I designed and we had David's studio built. David was in full production and he stopped work here, moved everything up to the studio and started work there without ever having time to consider work flow optimization. And for over 20 years, things have just evolved in his shop. You can tell by the pegboard and little drawers that David is basically a very organized person. The problem wasn't so much a lack of organizing effort but more one of grouping tasks. Below is a view from the front looking back. And the same area from the back looking front. Too many things didn't have homes. 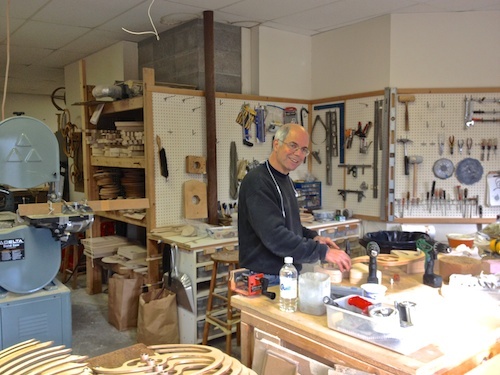 His workshop is a space any DIYer would love to have. It is spacious and well equipped. In fact the spaciousness becomes a problem. Time is money and when you spend a lot of the day walking back and forth, you loose efficiency. And things got lost. David would put a tool down and lose time trying to find it later. An intervention was welcomed! In the back was the "Everything Else" corner and it was totally lacking in organization. It was arranged in the "stack it on top" method. We start by discussing how he works and uses the space. We categorized tasks and types of storage. We talked about what worked and what didn't. I redesigned his space and did up a proposal in iDraw. You can't really see the details but the dusty jobs are grouped together, assembly tasks are grouped and power tools were placed near their assigned tasks. Dust collection is improved and lots of enclosed storage is added. David approved the idea which does keep changing as we work. That is a requirement when doing a project with David. He is an inventor at heart and he is always considering other solutions. David decided to go ahead with the re-org but we knew he had to be able to keep working as we moved things around. Over the past few months, when there are breaks in his schedule, we have completed portions of this project. I will share with you a variety of the changes we have made and new photographs of the evolving studio over the next few posts. We are still upgrading. Stay tuned! Marji introduced me to the creative arts during college and some of her work inspired me to try my hand at kinetic sculpture. If you dip into the history of Wood That Works http://www.woodthatworks.com/david_roy_history/ you'll see how she's been my teacher, inspiration, partner and muse. 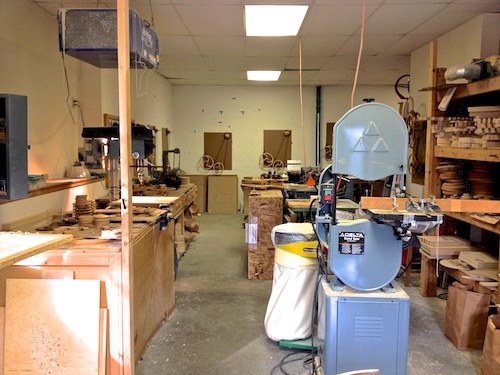 The shop renovation project is just the latest that is changing and improving my life and work. 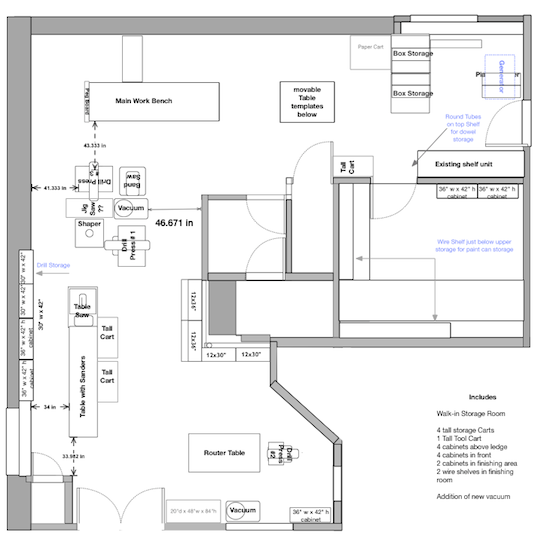 Marji measured the space, asked questions and presented me with a plan that completely turned the shop upside down. It was one of those times when you bang your head and wonder why you never saw something so obvious. I was nervous that the transition period would be hard, I've developed a lot of habits over the years. In fact it has been easy. The new arrangement just makes so much more sense. My feet occasionally take me to the wrong end of the shop when I'm daydreaming but that's nothing new! Thank you Marji, brilliant work.